Canary Security System — MumbleBee Inc MumbleBee Inc.
We received a Canary Home Security system and the Canary is a complete home security system packed into a single device-a modern approach to security that lets you protect the people and places you care about most. It’s built to learn and adapts to your home over time. Should it detect something out of the ordinary in your house or apartment, Canary sends intelligent notifications with HD video and audio directly to your smartphone. With no contracts or required monthly fees and free cloud storage of recent events, Canary works right out of the box and with its intelligent notifications only alert you when something unusual happens, you will enjoy peace of mind when all is quiet and have the opportunity to react swiftly and efficiently when it’s not. The Setup was a breeze and since the Canary is packed with built-in sensors, additional components aren’t needed. The setup took minutes and all done with the free iPhone or Android Canary app. You must have an internet connection “Wi-Fi” in order for the Canary to work. The camera is amazing with 1080p HD camera, 147-degree wide-angle lens and records high-quality audio along with all HD video. Not only does it record, but you can view LIVE and hear what’s going on any time from your smartphone. 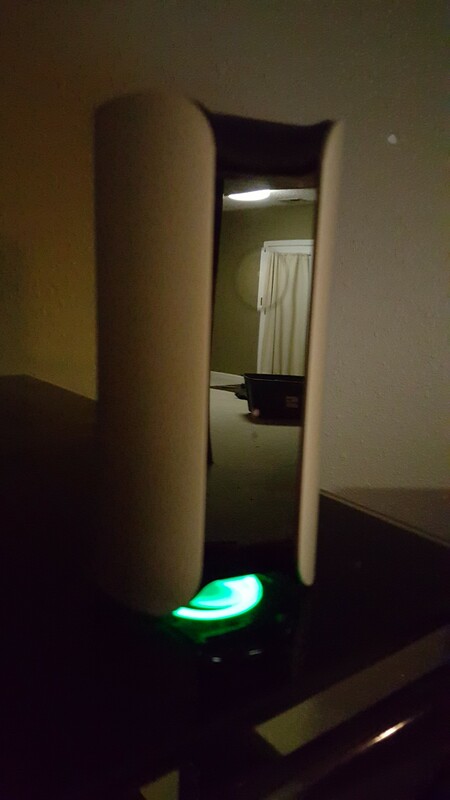 Another great feature the Canary has is the automatic night vision along with the 90+ dB siren that will sound when activated. I also love the idea that the Canary has an automatic connection to your local authorities and can be notified with a touch of a button. What makes this really cool is that once you sign up and activate your Canary, all your information is already on hand for the police, ambulance or fire department. Let’s hope this would never come to that, but it is an excellent feature to have when needed. The Canary is Built to learn by algorithm-based motion detection learns over time to send you smarter notifications with fewer false alarms. So if you are not home you would receive instant video alerts on your iOS or Android device. Easy options allow you to respond to incidents before they turn into emergencies. With the Canary’s sleek and modern design you would never guess that that piece of decor’ would be watching your every move and with the ability to arm itself on its own as soon as you leave the house. We are really impressed on how accurate the Canary has been as to when my husband or I leave the house all because it is connected to our phones and even lets you know when that connected person comes back home. We also love the options to arm or unarmed the Canary on our own or to set the Canary for Privacy mode which means you cannot view LIVE nor will it record and send us notifications. Even while in privacy mode if we were both to leave the house, it would automatically arm itself. Which is great without busy days and that is once less thing we have to do and worry about. Another great feature the Canary has is Homehealth Technology which allows the device to monitor air quality, temperature, and humidity. Our heating and cooling system has the same feature to help us understand how our home might affect our health. I always like something to compare too and the Canary is very accurate at letting us know what the temperature is in the house along with the humidity levels and if our air qualities are in the normal ranges. Now here is another feature I think you will enjoy. The Canary has NO contracts or monthly fees, but you are limited. For instant the free basic security package is included with purchase, featuring 12 hours of cloud video storage, a limit of five permanently saved video clips, and video recording while Canary is armed. Which for us this plan is perfect because I work part-time and home a lot, but if you are the type that is gone long hours a day every day or travel then the upgrades may be better for you. When you activate your Canary for the first time you will get a free trial of the 7-Day Premium plan with an extended timeline and more bookmarks. Since the Canary has to be connect to the Internet we had to make sure or connection was secure because we have so many things that depend on the internet and our router can only handle so much. Heck it could barely keep up now with all the computers, phones, tablets and streaming we do with Sling TV because we don’t have cable we stream all our shows. Why pay for stuff you don’t even watch? I can watch and pay only for the main channels we watch and not miss a show and the kids have theirs as well. You can get a one month free trial of Sling TV and try it out for yourself, but after that it will be $20 a month and more if you add specialty channels like HBO®. When we hooked up the security camera it cuts out on us even more. We don’t want our security system to fail because of a faulty router. 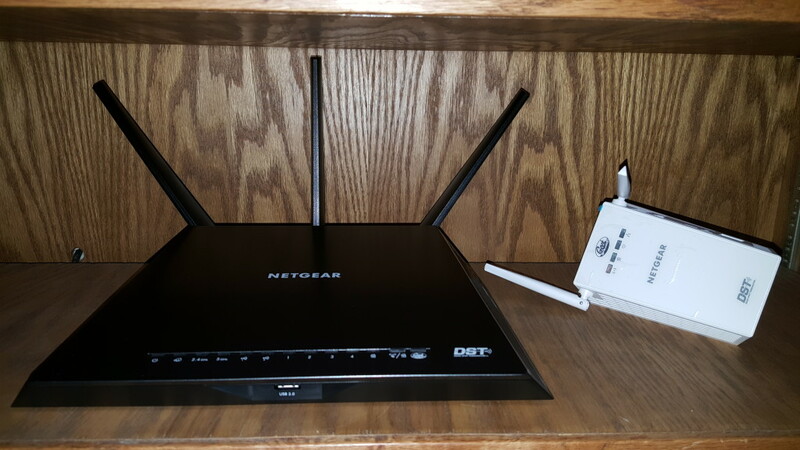 So, we added the NETGEAR – Nighthawk DST AC1900 Wireless-AC Gigabit Router with DST Adapter to give us the boost this house needs! Boy does it ever, we have over 3,000 sq ft and a multi level home. I am impressed how much stronger our signal is and best of all no more dead zones! Also, this router comes with one year of Geek Squad® Home Network Support via Phone and Web which allows us to call or get help 24/7 whenever we need help. Seems very accurate so far and we have not had any defects so far. The Canary Indoor Wireless High-Definition All-In-One Home Security System comes in white, Black or silver it is very easy to unplug and move from room to room if needed. This makes a great addition to our new home to give us some peace of mind and security for when we are not home not to mention to help keep and eye on out two dogs while we are away as well. My only bum feature is that there is no back up battery for when you lose power. No power no nothing so you will lose that security blanket and your food goes bad, but hey what you gonna do? Since there is no battery it has to stay plugged in at all times and you have to hide the cord. Overall when said and done this is your go to indoor security camera. Just pick a spot that works best for your home or add more cameras if needed. Not bad for a new company that came out on March 2015. Adapts to your home over time, sends notifications with HD video to your smartphone and no monthly fees or contracts needed; quick and easy set up. The reviewer has been compensated in the form of a Best Buy Gift Card and/or received the product/service at a reduced price or for free. This review was written solely by MumbleBeeInc. This item(s) was provided complimentary to MumbleBeeInc for the purpose of this review. I was not paid for my personal opinion of the product(s) contained in this review. All opinions are my own and may differ from those of your own.